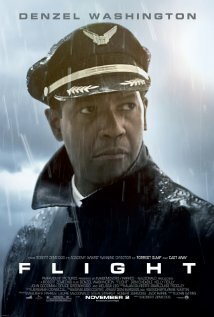 Today Teena, Ken and I saw Flight with Denzel Washington at the Silver City theater in Ancaster. Whip Whitaker, a seasoned airline pilot miraculously crash-lands his plane after a mid-air catastrophe, saving nearly every soul on board. After the crash, Whip is hailed as a hero, but as more is learned, more questions than answers arise as to who or what was really at fault, and what really happened on that plane? The movie starts off fast with the plane crash occurring in the first half hour. The flight and crash were very realistically done and had me on the edge of my seat. Whip, excellently played by Denzel Washington, had been drinking and doing some coke before taking off on the plane for a short, less than an hour flight to Atlanta. It was mechanical problems which cause the plane to crash and Whip makes amazing moves that save most of the passengers. I am not giving away anything the ads don't already show. The rest of the movie involves how he copes with his life and drinking afterwards and the investigation into the crash. It is a very good movie but I found it a touch long. The opening half hour is riveting. I give it a 7 out of 10.